Most animal owners are well aware of the terrifying effect fireworks and thunderstorms have on their pets, and as such will be very considerate by not aggravating the problem by shooting off fireworks close to their pets. 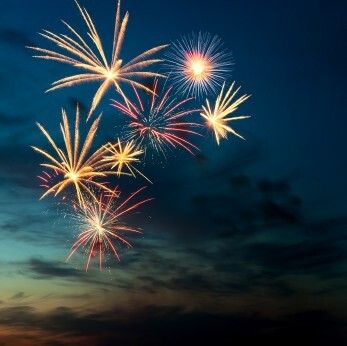 The problem comes in when neighbours or friends, or other unrelated parties, start shooting off fireworks in residential areas, or close to residential areas like in public parks or from shopping centres, to entertain others and celebrate festivals. The most well-known festivals which lead to the shooting of fireworks are Guy Fawkes (5 November), Diwali (13 November), and Christmas and New Year’s Eve. This is the time of year when pet owners need to take extra precautions to make sure that their animals are taken care of during these events. Vets often see an increase in emergencies during this time when animals try to push through security gates, jump fences, scratch down doors or destroy enclosures, trying to get away from the noise and perceived danger. As responsible pet owner it is imperative that one prepares in advance to calm your animal down and keep them safe during these events. There are a number or remedies available. The first and most effective remedy is removing the animal from the noise and sounds and the visual impact of exploding fireworks. Closing the animal in a room which is soundproof will always be first prize. Unfortunately most homes do not have such rooms and the next best option is to put the animal in a room where you can switch on calm music relatively loudly, to try and muffle the sound of exploding fireworks. This may not be effective in all cases because loud music in its own right can be very disturbing for some animals. Animals’ sense of smell and sound are usually much more acute than that of humans, and this needs to be considered when playing loud music. Most animals will feel a lot safer and calmer in their owner’s presence rather than being left on their own. Therefore it is not a good idea to close the animal in a room and just leave them there. If you can stay with them, the experience will be much more tolerable for them and one can calm them down physically by touching and stroking them and talking to them in a calm, friendly voice. A number of animals will not calm down no matter how much you try and remove them from the situation. In these instances, you are going to have to consult with the vet to find out what medication options there are available to calm the animal down. Vets have a number of remedies varying from unscheduled natural nutriceutical products, to stronger scheduled prescription drugs. Some drugs or medications may cause the animal to be sleepy or drowsy without addressing the anxiety. This does not really help. A sedative, without something which helps “taking the edge off” the anxiety, may be more harmful, because the animal will have less control over its actions if it tries to get away from the noise. The vet will have to assess the situation with you and decide which remedy will be most beneficial in your animal’s case. If the vet prescribes a scheduled drug, it can only be for a specific time frame. The reason why scheduled drugs cannot be given in unlimited quantities is usually related to unwanted side effects associated with prolonged use. Some animal owners become very upset with vets if they do not want to repeat a script without seeing the animal first. Vets are bound by regulatory requirements when it comes to prescription drugs and is therefore legally not entitled to prescribe certain drugs without examining the patient first. If the vet prescribed medication for your pet last year which worked very well, and you would like a repeat script this year, depending on the schedule of the drug, the vet may not be able to repeat the prescription without seeing the animal (even if your animal seems to be in perfect health). The directions for use in the administration of medication is also an important aspect if this is the route one has to go to calm down your pets. Most medications need to be given before the onset of the anxiety attack. Once the animal has become anxious there will be a secretion of stress hormones like cortisol and adrenaline inside the animal’s body. This may counteract the medication prescribed or administered, which in turn will lead to it being less effective and the animal suffering adverse consequences. It is therefore imperative that you follow the dosage and administration instructions carefully to ensure the best possible outcome. Thunderstorms are less predictable than fireworks events and contingency plans should always form part of the general care of your pets if they suffer from anxiety during thunderstorms. This may require an owner to keep a closer watch on weather forecasts and medicate early enough or make plans to protect the animal as much as possible from the exposure. Animals that suffer anxiety attacks may act irrationally and even aggressive and therefore exposure of anxious animals to small children, who may suffer anxiety themselves or who may act impulsively around an anxious animal, is something which should be kept in mind and prevented if possible. Even with the best care and precautions, it still happens sometimes that an animal will escape or run away during a thunderstorm or when fireworks are in progress. In this regard, it is imperative that every animal should be microchipped. A microchip is a small device, about the size of a rice grain granule, which the vet can implant under the skin of the scruff of the neck between the shoulder blades. This device carries a number, which when scanned with the appropriate scanner, connects the number with your details. Should the animal through some misfortune manage to run away, you will still have a means of locating them; or rather you may be located as their owner should they be found and taken to a vet, animal shelter or welfare organisation, who has a scanner. Municipal bylaws usually protect animals to some degree but unfortunately have never been completely successful in stopping the use and abuse of fireworks. “Prevention is better than cure” and knowing your animal’s temperament and response to fireworks and thunderstorms will go a long way in taking the necessary precautions to prevent animals from hurting themselves or other animals or people around them, should they be exposed to these events.